Rocky doesn’t end with a knockout, but its ending is a knockout – thanks to Ray Bradbury. Sound unlikely? Film editor Richard Halsey says it’s true. While focusing on Bradbury’s fiction, people can forget he also had a lucrative career as a script doctor. 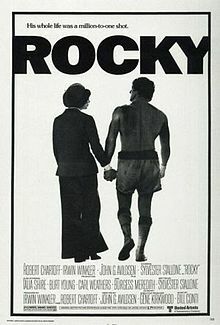 And although they changed Rocky’s ending, I wonder if the image used in the theatrical poster comes from the original concept?